Why would you go to Las Vegas with kids when it’s better known as sin city? 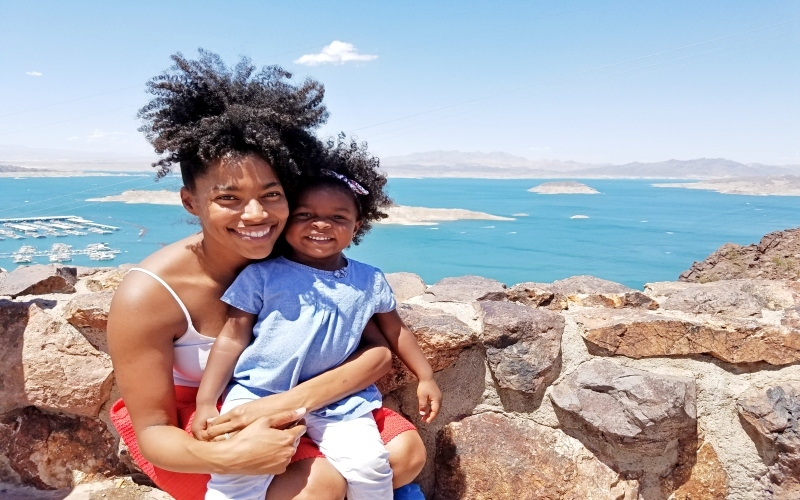 Well outside of the strip regular people live in Las Vegas and many of them have kids so yes you can plan a Las Vegas family vacation. 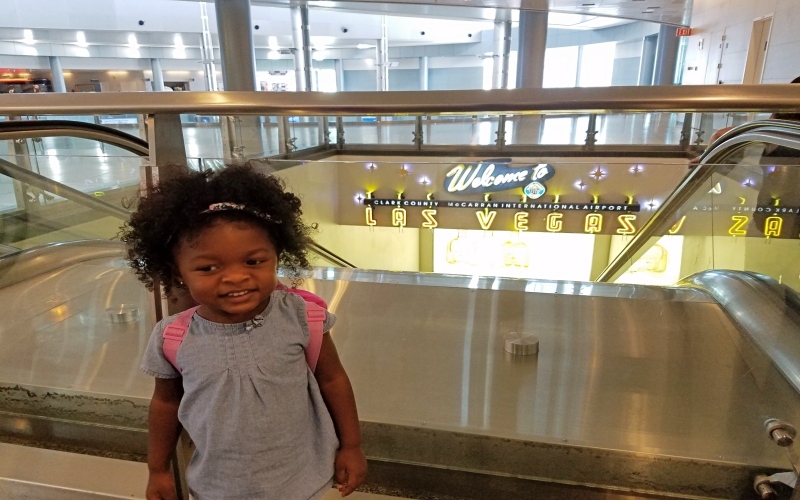 Here’s how to spend 3 days in Las Vegas with a toddler or older kids too! I had just quit my job and had two weeks (unpaid) before starting my new job and I wanted to take advantage of this spontaneous time off . Where we went didn’t matter but it needed to be affordable but I couldn’t find any posted flights deals for the upcoming week. 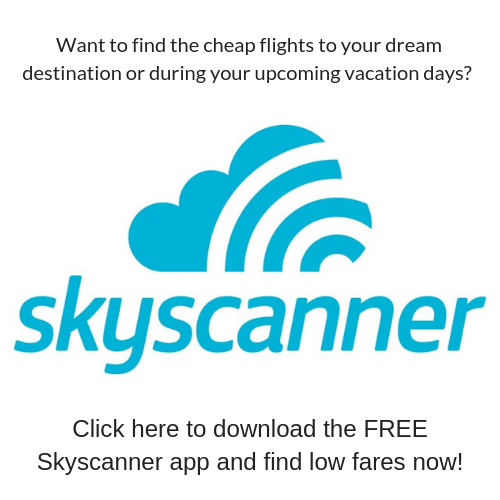 I turned to Skyscanner to find the cheapest flights from my home airport in the next two weeks. If you have a specific destination in mind but are flexible on the dates you can also search Skyscanner for the cheapest time to go to that destination. They have a free app I use often, download it here. 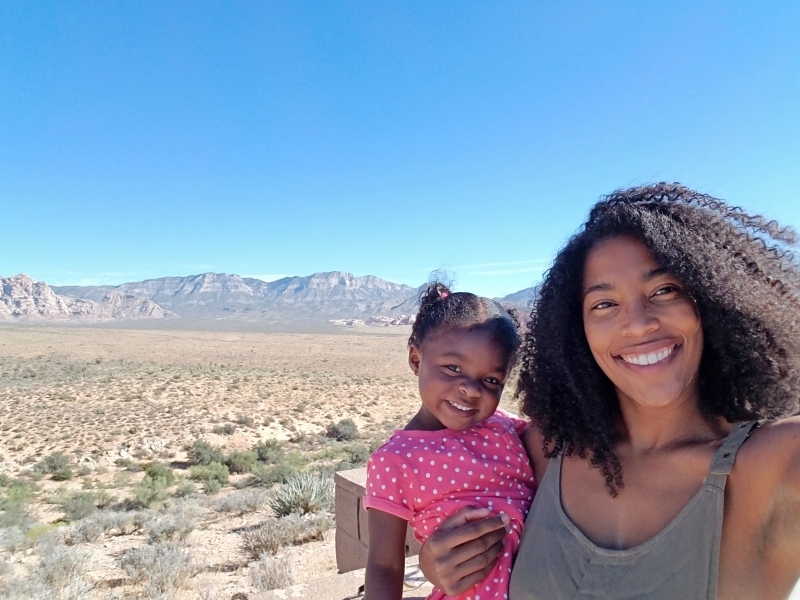 Since I was traveling to Las Vegas with a toddler in the dead of summer, we started our days very early in the morning to beat the burning sun. We then took a long afternoon break before heading out as the sun began to set. Be sure to always take water with you when you’re exploring the outdoors and bring plenty of sunscreen. We visited again in November as the starting point of our Southwest road trip and the weather was much more enjoyable. I recommend visiting October-November or March through mid-April for the mildest weather. We landed in Vegas at 9:30AM with a full day ahead of us. We went straight to the Hoover Dam which is a 40min drive from the airport. Parking at the Hoover Dam is $10 per vehicle. If you just want access to the Visitor’s Center without going on a tour it is also $10. The Power Plant tours lasts 30mins while the Hoover Dam tour takes 1 hour. The Hoover Dam tour is only accessible to those over 8 and wheelchairs and crutches are not allowed. If either of these restrictions apply to your group you can only do the Power Plant Tour. Honestly we got most of the information from the short movie they show before each tour so if you can’t do the Dam tour you aren’t missing too much. 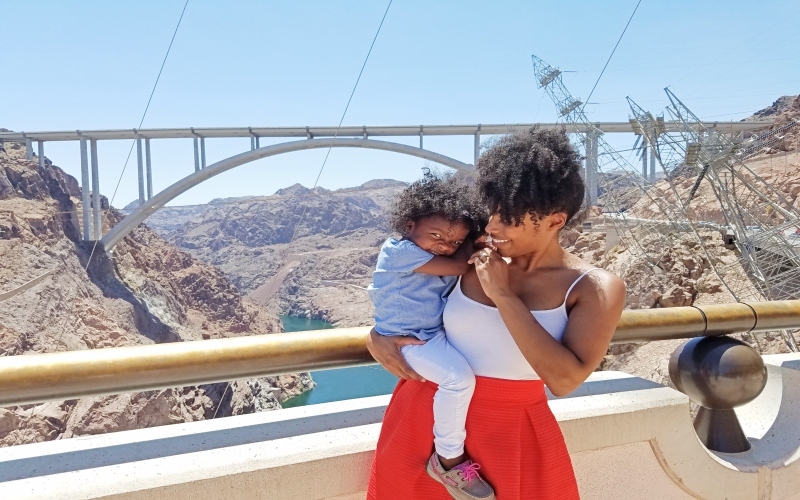 All Hoover Dam tours are free for kids 3 and under. The Power Plant tour is $15 and the Hoover Dam tour is $30. They have special discounts for seniors and military personnel and you can find more info here. On the way back to Vegas to stopped at the Lake Mead Overlook. It’s a short stop but you get a stunning view of this man made lake. 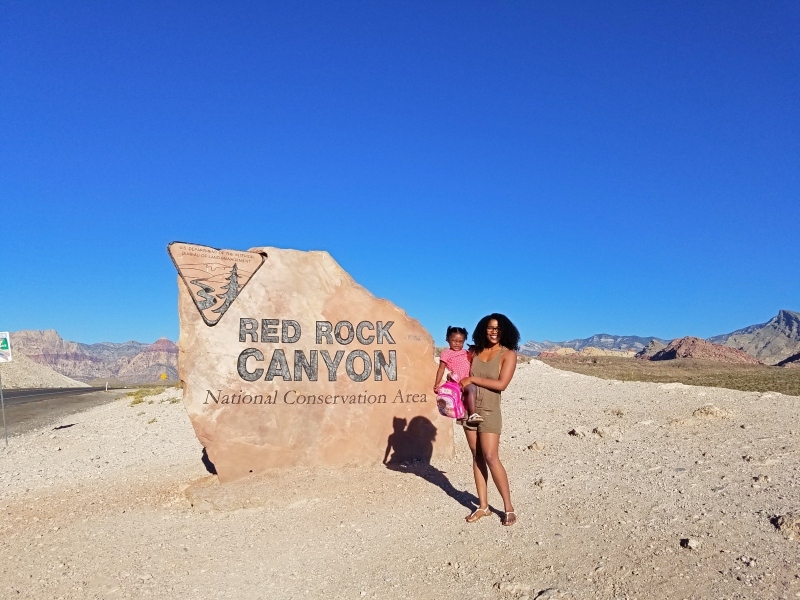 We spent our 2nd day exploring Red Rock Canyon, a National Conservation area located about 13miles from the strip. They have a 17 mile scenic drive in addition to quite a few trails ranging in difficulty. Don’t worry you can still see lots of its beauty from the several overlook stations if you’re not up for a hike. The park opens at 6AM and closes at 8PM during certain times of the year so be sure to check out their website to confirm the hours during your stay. The current cost is $7 per vehicle. The Visitor’s Center is a great place for kids to explore and learn about the canyon and the wildlife that live there. It is only open from 8AM so if you are headed there earlier you will have to kill some time before it opens. If you are really adventurous you can also camp overnight in the park. The amount of time you spend in the park really depends on how many trails you hike. There are also many overlooks you can stop at take in the views. We spent about 3hrs in the park. There are restrooms at each overlook but they are basically outhouses so be prepared to hold your breath or hold it until you get to the visitors center. We spent our 3rd and last full day` exploring the strip. I know what you’re thinking. 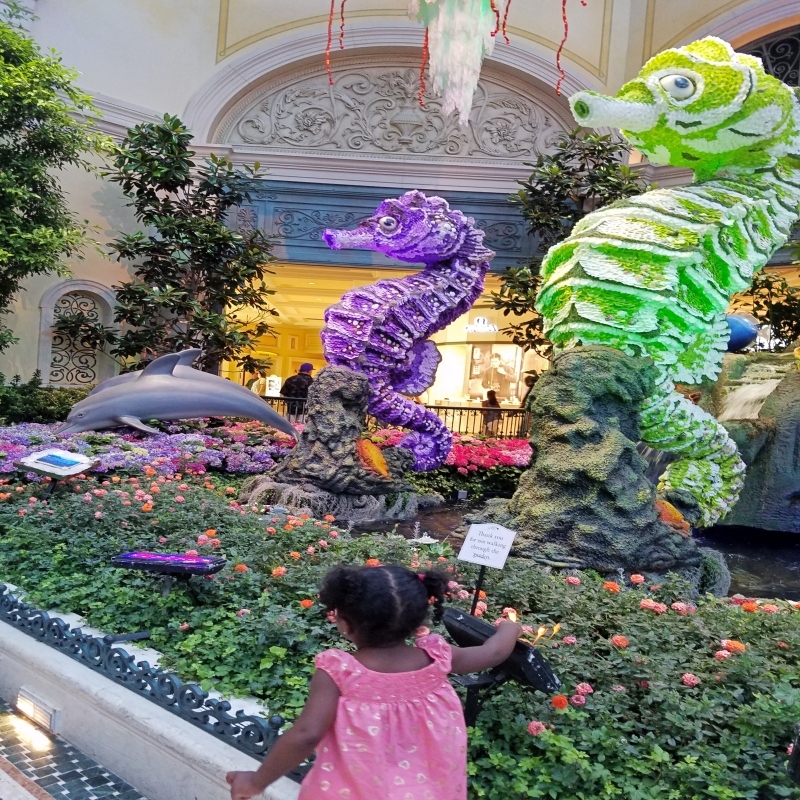 Are there things for to do on the Las Vegas strip with toddlers? There is plenty and the best part is a lot of them are free! We started the day at the Flamingo to visit their free wildlife habitat. It is a small outdoors habitat with various birds: parrots, pelicans, and flamingos. Nothing exciting for an adult but my toddler was very excited to see the Flamingos. They open at 8AM and have two daily pelican feedings at 8:30AM and 2:00PM. We parked in their parking garage which is still free, (all MGM properties have begun to charge for parking unless you have a Nevada license). You can find out more info on the Wildlife Habitat here. Next we drove down to the end of the strip near Circus Circus and had breakfast at the Peppermill, a neon-lit diner that has been on the strip since 1972. They have their own parking lot which is free for customers to park in. Both the food and service was great and they have high chair! Check out their menu here. Circus Circus has a free circus show every 30mins, starting at 11AM until midnight. 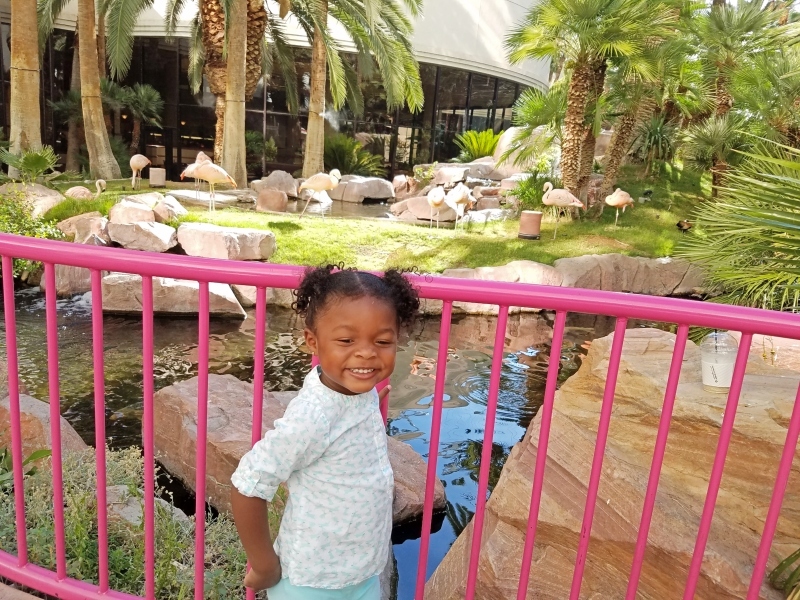 We aren’t huge circus fans so we skipped this activity but it’s a great option when visiting Las Vegas with toddlers. We drove to the other end of the strip to Mandalay Bay to check out the Shark Reef Aquarium. Mandalay Bay is apart of MGM properties and parking is no longer free unless you self park and stay less than 60mins. Nevada state license holders are granted free parking with ID until December 30, 2016. You can find out about parking fees at each hotel on the strip here. 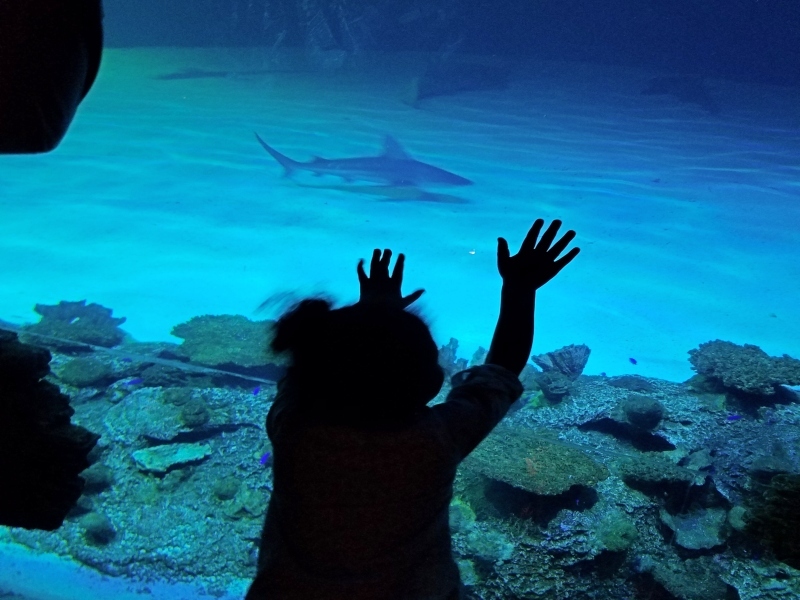 Shark Reef Aquarium is small by adult standards but a great size for toddlers. They have a touch tank that my daughter did not want to leave. They also have two walk through aquariums where the fish are swimming on both sides of you and above you. Admission is free for kids 3 and under, 4-12 is $14, and adults are $20 for standard admission. 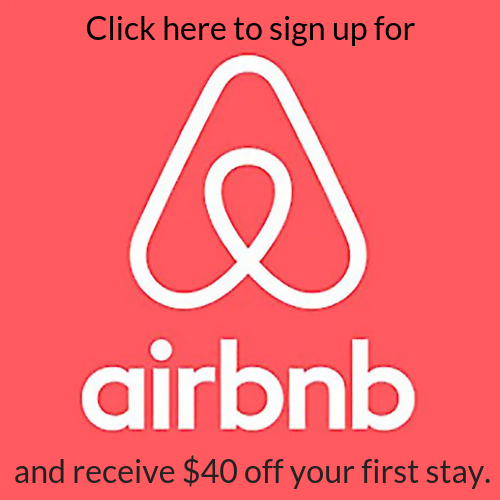 If you have a Nevada license you receive a $3 discount per person. 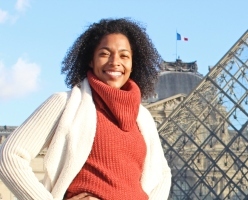 Find out about more admission options here. After the Aquarium it was time for a nap. We waited until it cooled down to head back to the strip and drove to the Wynn which has free valet. 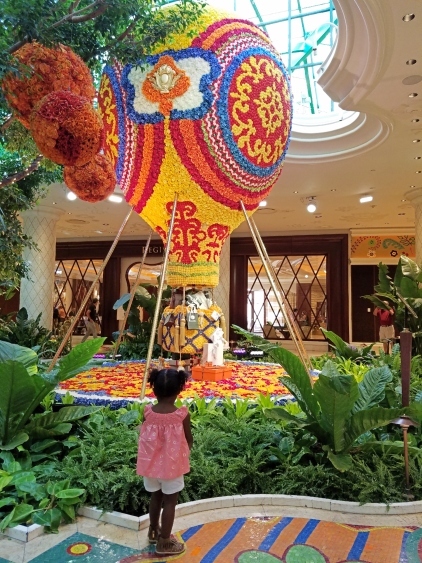 Here we checked out their sick array of flower displays including a hot air balloon and carousel. It is so amazing what they did with flowers and my daughter was so excited, jumping up and down when she saw them. We left Wynn and drove down to the Bellagio (no more free parking). Here we went to their Conservatory and Botanical Garden. The level of excitement on my daughter’s face with her screeching when she saw this place was so unbelievable. It made me so happy! After the botanical gardens we walked to the front of the hotel to take some pictures with the Eiffel tower in the background and watched the fountain show. Then we got some gelato and walked to the other side of the fountain to watch another show- they are each different as the water moves to a different song. The shows are from 3PM-midnight, every 30mins from 3-8PM and every 15mins from 8PM-midnight. It was nearly 9PM so we headed back but Jordyn had a great time. I hope I’ve convinced you that Las Vegas with kids is possible and appropriate. 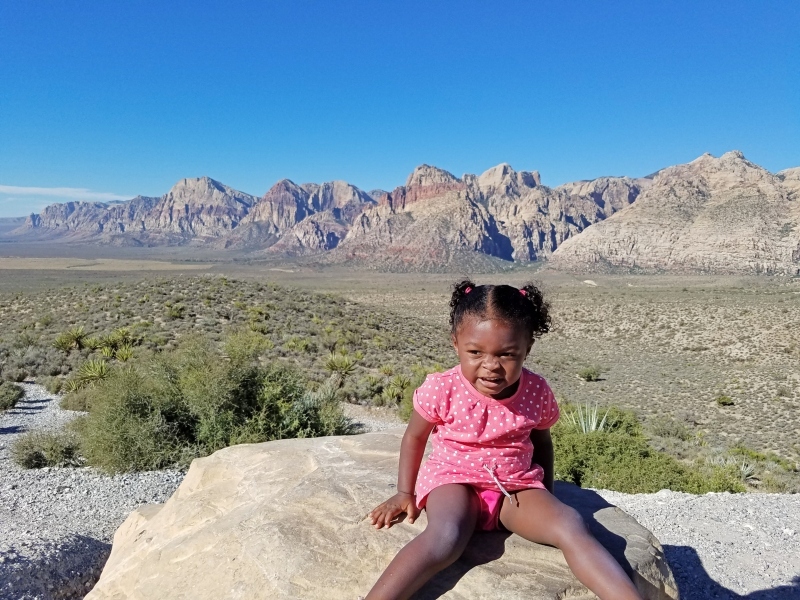 Share this article to show someone else there are things to do in Las Vegas with a toddler. Enjoy your Las Vegas family vacation! 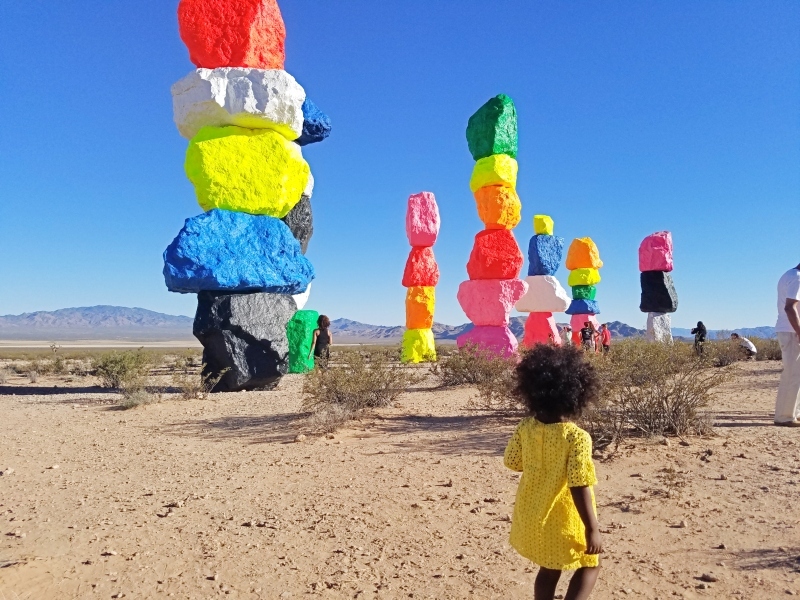 There is so much to do in Las Vegas besides the strip and we only scratched the surface. Enjoy your trip next month, and Happy New Year! What hotel did you all stay at? We stayed with my friend who was living there at the time. I have stayed at Treasure Island previously before I had kids, it was nice, but it is at the end of the strip.